If you would like more information on our exchanges with Instep have a look a the video below. Instep from Pure Proper LTD on Vimeo. Since its inception LAW have been passionate about helping bright young individuals at the start of their careers to take the first steps into a professional role. As such, we have always provided the highest quality placements for our learners that help them to grow. Our placements include training in accredited courses in Leadership and Management by the ILM worth in excess of £1500. We guide learners through the process of personal development and allow them to discover their role within the company that builds upon their personal experience and training. We teach learners the tools they might need to develop themselves and provide them with the opportunity to develop their own career path within their own country. In addition to the relevant training, learners undertook a work experience placement specific to their vocation, the learners were provided with job advice and guidance to prepare them for the placement. Training involved preparation for a fictional job application; they were prepared for the interview and underwent an interview in English. The learners were asked questions that you could be expected to answer during a typical interview. 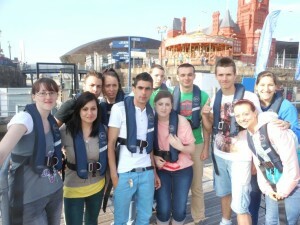 Post training, all learners went on a trip around Cardiff to see some of the many sites of cultural significance. 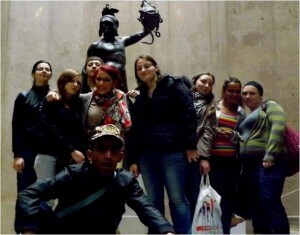 Pictures of the exchange, cultural visit and team building can be found here. Over the past year we have been working with a French company called Adice to source local internships for individuals on exchange from ADICE. These exchanges tend to be for around 2-3 months and learners develop a wide variety of skills based on their particular vocation of choosing. This will normally revolve around developing professionalism and soft skills that are otherwise overlooked by young learners. Learners from Adice are generally of post graduate level of study and have expressed an interest in a particular area of study. Working with Adice, we find suitable placements for the learners, provide them with English language training, and organise accommodation with a host family. Learners are from various backgrounds but most are lacking in experience. Pictures of the training and cultural trip can be found here. LAW working with Instep designed a Environmental Sustainability programme aimed at developing Environmental awareness with learners looking at engaging in Green and sustainable jobs. These focused on green energy, Environmental conservation, and habitat conservation. Learners were to undertake a 2 week programme and visit various government and private schemes aimed at preserving and sustaining the Environment or producing Green and sustainable energy. Like all of our programmes there would be a focus on developing English Language skills in addition to professional skills that would help learners to attain employment in relvent sectors once they return home. Our most recent exchange is with our partner from Lille, Instep. We have begun an environmental sustainability and green industry exchange that intends to impart some of the ideals of the green ethos and sustainability upon our learners. The main focus of the exchange is to show with real world examples of how green industries can not only have a positive effect on the environment, but be profitable at the same time. Learners will have taught and practical lectures on the subject of sustainability, but also go on trips to local green and sustainable companies to see how green business can be an integral part of any European countries economic policies. This sharing of best practises that the programme will focus on is essential, not only for European countries, but for countries around the world. Few industries can be spread quickly as green industries need to be and these programmes are essential for the environment and future generations.